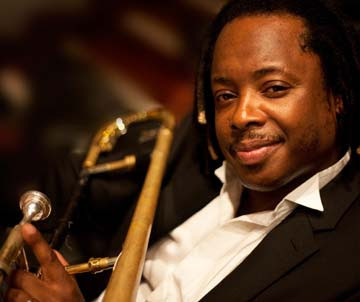 Darlington Jazz Club are hosting a Summer Gala Concert this Saturday, 2nd July, featuring the incomparable Dennis Rollins with the Durham Alumni Big Band. Dennis teamed up with the big band for the Darlington Jazz Festival and went down a storm to a sell out crowd so this one is sure to be a concert to remember. The band will perform a selection of big band material spanning from the 1950s to the present day. Raised in Doncaster, Rollins was a member of the Doncaster Youth Jazz Association before moving to London. Now based back in the North, he is a core member of the DYJA team and the North is lucky to be able to hear him perform regularly. Doors open at 5:45, music from 6:30. Tickets are £6 on the door. Audiences are advised to get there early to ensure they get a ticket!